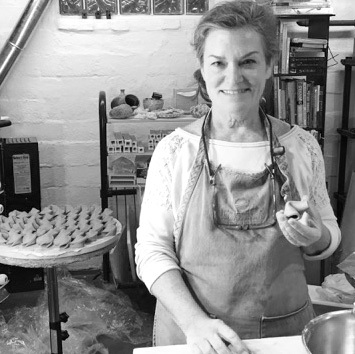 Our guest this week is an Indianapolis based ceramic artist and educator Peggy Breidenbach. Her ceramic work beautifully reflects her personal universal observations about life, change, growth and the fragile beauty of now. She is influenced by forms found in nature and by nature as metaphor. What does working improvisationally mean to you? How would you define the 'Art of Improv'? A few years back – after reading Tina Fey’s book, Bossy Pants, I became very interested in Improv. I took 2, eight-week workshops in it. This was completely out of my comfort zone and truly terrifying at first. But it was also super liberating. Improv is about saying “yes” to the situation your improv partners are presenting you with and then adding onto it with your own “and”. There’s no time for thinking. It’s about trusting your own instincts and trusting your fellow improv partners as well. It’s a great skill to develop. Working improvisationally for me means trying to approach the clay with few preconceived notions. If I can allow myself some time to simply play with the clay, I usually end up with something pleasing and new. It means following my instincts. I also find that when I have limited inputs (time, material, tool constraints) I will make do with what’s around me. For example, we have a cabin we frequently go to for weekends. Sometimes I’ll bring some clay and a few tools and make simple pinch pots while sitting outside. Often though I forget the clay and find myself creating with what’s there. Sticks, rocks and other stuff. One day while cutting back wisteria at the cabin, I found myself with all these long, beautiful, green vines. I started to weave very primitive baskets with them. This lead me down a road of making ceramic pieces that mirrored these basket forms. Have you always worked improvisationally? I have not always worked improvisationally, but it is mostly my approach now. Do you work improvisationally, consciously, intentionally? If so, how do you begin? If not, how do you find yourself getting there? Yes, I will often make what I call “blanks”… sometimes these are small, closed forms that I will paddle/pinch/cajole into a shape and/or add some other surface elements to. I LOVE these closed forms, as they possess volume and dimension and are completely contained… like little pods or buds or eggs. They hold so much potential… What will be born by them? Other “blanks” I work with are clay canvases that I make (usually squares) and push together and build upon. These become wall pieces that can be mounted in various configurations. How often do you work improvisationally? I would say 90% of the time I’m working this way. Sometimes you just can’t. Recently, as you know, I took an idea I’d been toying with and, with your encouragement, ran with it. The idea was to make ceramic fortune cookies and fill them with inspirational quotes - small gifts of wisdom, truth & joy - to give out at our art center’s annual faculty show. This involved making hundreds of clay fortune cookies. While repetitive and meditative, there wasn’t much improvisation involved. I did however use improv to construct a small wire loop needed to hold the cookies while dipping them into a colored slip. I felt good about that. Please share a bit about your process. Do you have methods to getting started? Do you have tricks to getting unstuck? Do you have motivators to finishing up? Just doing something is usually enough for me. I recognize when I’m avoiding the studio… or other life stuff gets in the way of me getting there. The urge to create builds up inside me and I know I have to go do something, anything, to get things going and have progress. Pushing the material around is often enough for me to know what needs to happen next. Listening to my instincts, what’s pleasing, and getting lost in the process. It moves me along to the next steps… how shall I finish? Should I glaze or burnish? Where is this going? Where do you find inspiration? How do you use it? All over… often from forms I see and love around me, like stones, or seeds, flowers, tree bark, fungus. I’ve collected all sorts of these things all my life and I think what’s happened is that I just sort-of absorbed it all by touching and looking at things. I also find great inspiration from the work of other artists. These include Georgia O’Keefe, Richard Serra, Hans Coper, Isamo Naguchi, Alice Ballard, Chris Gustin, Christine Nofchissey McHorse and Florian Baudrexel. I try to pay attention to what really moves me about their work – their lines, their sensibilities and incorporate those into my own. One day a few years back I found I was weary of making smooth, undulating, sensuous forms. I had been looking at works by Florian Baudrexel. I literally got out a 2x4 and starting whacking away at the closed form. I loved the results. For a period, I challenged myself to work on the edge… nothing soft. I also find that whatever I’m going through in life, always finds its way into my pieces… aging, loss, control, fragility, etc… it all comes out in the clay. What advice would you give to someone interested in trying to work improvisationally? Can you share some good advice that you received that helped you become more comfortable this way? My advice would be to pay attention to what you love and give yourself the time and space to just play with your material. It will all come out in the process. Also, try to surround yourself with smart and supportive artist friends, I consider you in this group, Jen. I can be so hard on myself and these friends have helped me out of some slumps. … all my ideas were magic! What are reading, listening to, watching, or any other inspirational obsessions you would like to share? I find journaling and reading poetry helps me know myself and understand my place in the world. Some poets I love… Mary Oliver, Tony Hoagland, Billy Collins, Faith Shearin, Louise Glück and Marie Howe. Thank you Peggy for sharing your work and your ideas on the improv process. I love that you took an actual improv acting class and pushed yourself out of your comfort zone in this way! Your appreciation of nature, play and the now is evident in the form and beauty of your work. I am so lucky to say you are one of my smart and supportive artist friends! I thank you for that. You must check out Peggy’s most recent project Food for Thoughts and follow the way it spreads small gifts of wisdom, truth & joy! You also can learn more about Peggy, and see some recent work on her website and follow along as she inspires and shares more about her process on Instagram. If you would like to be featured on The Art of Improv please contact me! I would love to hear how improvisation impacts your art making process.